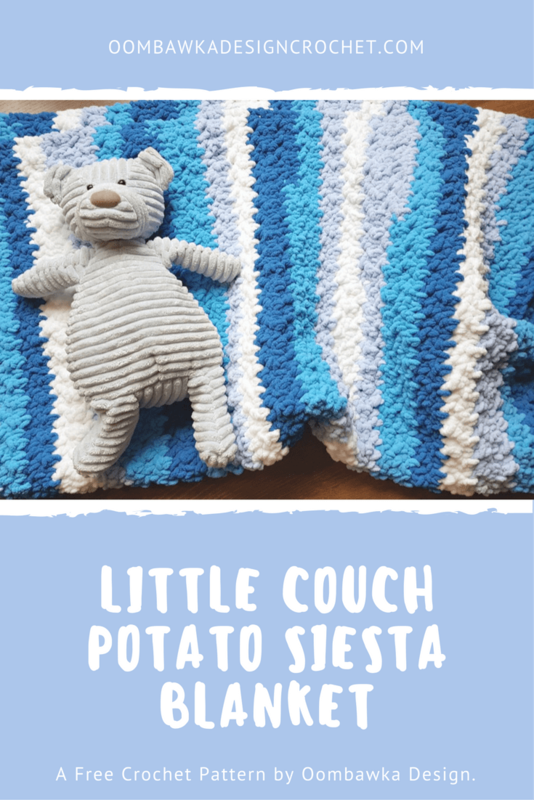 The Little Couch Potato Siesta Blanket is soft, squishy and oh so squeezable – it is the perfect blanket to cuddle with. The first thing Drew said when he saw his new blanket was “It’s So Soft and Fluffy!”. I picked up 3 cakes of Yarnspirations Bernat Blanket Stripes in 2 different colorways at Michaels about a month ago. My plan was to make 2 quick and easy blankets, one for Drew and one blanket in the second colorway for Darla. These blankets are actually meant for use during the summertime – sounds strange right? wanting blankets in the summertime?We have central air in our home and after spending the whole day outside and returning to the cooler air of the house it can be a bit chilly until our bodies adjust to the different temperature (even when set at 73-74 degrees F) – and with the children running in and out all day – in shorts and tank tops – the inside time warrants a blanket. They like blankets to cuddle up inside for cat naps on the couch, or during iPad YouTube and TV Cartoon time. 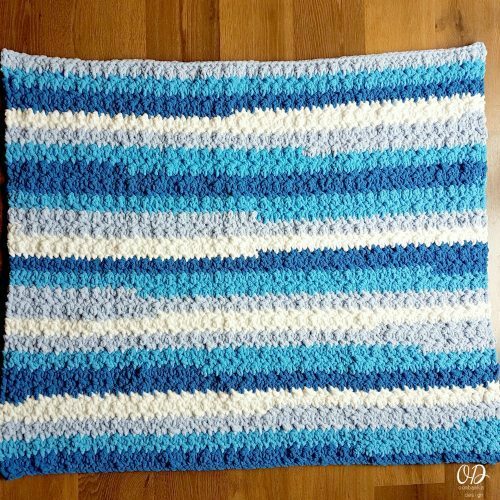 This Little Couch Potato Siesta Blanket was crocheted over the course of one weekend (at a relaxed pace), with 3 cakes of Pool Party Bernat Blanket Stripes yarn. The yarn was easy to work with and except for the final row of the project I let the colors come out of the yarn cake as they were dyed. The last row I removed a small section in the dark blue in order to use the next color in the ball to complete the final 2 rows in the same color. Two separate colors over the final 2 rows did not fit with the flow of the rest of the blanket. So if you end up in a similar place after you reach row 50 consider cutting out a small section and allowing the next section to take it’s place to make the blanket color flow a bit more smoothly. 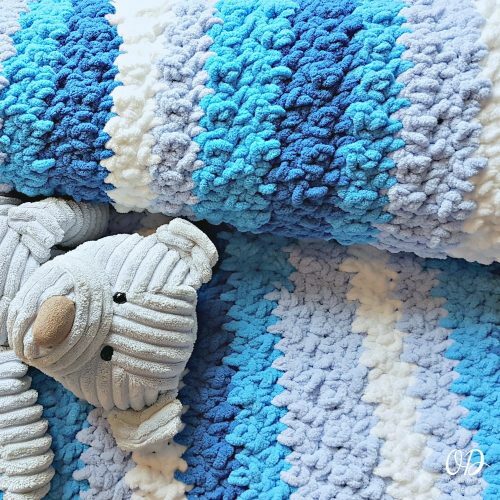 You can make this blanket in any sizes. The Stitch Multiple: Ch a multiple of 2 plus 1 for the initial turning ch. Drew’s blanket (pictured) is 40 inches wide and 36 inches long. Hi Rhondda – I had bought two balls of the Bernat Stripes but could not find that “perfect” pattern. Then I found yours Omg. Wow!! I love it. So I reduced my Cast in chain since I only have the two and it’s working ou t just fine.